Published in Buzzcuts, as part of the Virgin Australia Melbourne Fashion Festival Cultural Program 2015. Held in the iconic intimate space known as the No Vacancy Gallery, Concept To Creation: A Process is an exhibition made from every girl’s dream of having the perfect wedding dress. But this isn’t your typical showcase of bridal collections. In fact it’s quite the opposite. What sets this exhibition apart is that for the first time ever, we are given insight into the creative process itself – from its humble beginnings to the intricate final stages. 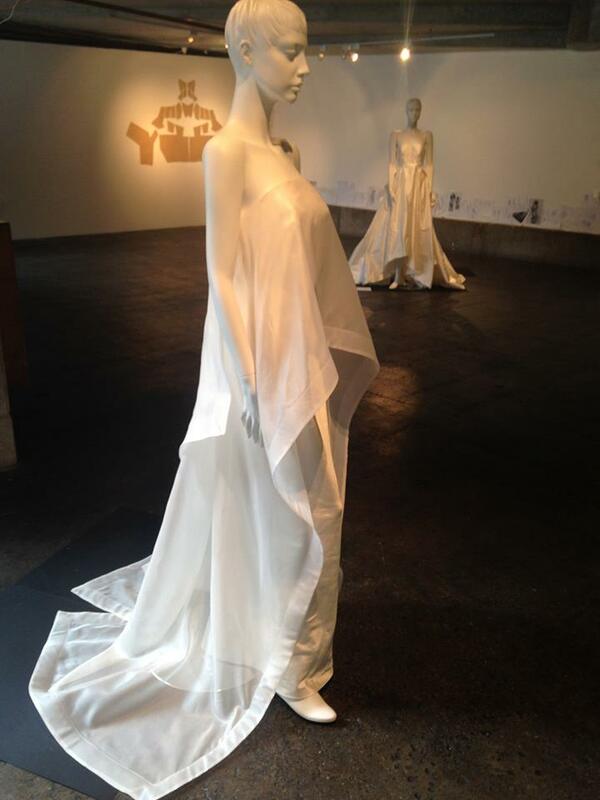 Created by emerging fashion designer Alexsis Cstar, the showcase takes the iconic wedding dress and lays it out for all to bear witness, revealing how a style comes into fruition, how an idea is formed and ultimately how these two intricate notions bring a vision to life. A celebration of the technique and thought process that goes into every unique dress, a universal marriage between art and design. Upon entering the gallery, we are immediately immersed in the relaxed atmosphere and entranced by the elegance each wedding dress exudes. Taking inspiration from architecture and geometry, each dress follows a consistent structure of clean cuts and sharp angles. What are immediately eye-catching were the names given to each dress. Names such Cate, Verity, Paloma, Margot and Alexandra permeate throughout each individual dress. It adds a human element to the entire exhibition, but when Alexsis explains the context behind them it takes the designs to a whole new dimension. “The names were inspired by friends, family or famous personalities. For example, ‘Margot’, with its sleek bias cut silhouette, was named because it evokes that 1930’s spirit, and Margot is a name that is reminiscent of the era,” Alexsis explains. When asked about her emergence into fashion, Alexsis explains that she did not find fashion, fashion found her. Originally working for retail and fashion boutiques, her interests in creating her own label ignited when friends and families would ask her to design bridal dresses for their wedding. After realising her passion in this field, she decided to invest full time and hasn’t looked back since. And the result of this effort has well and truly paid off, as evident in this exciting exhibition. But the major highlight was not just the beautiful designs, but the way Alexsis depicted her process to curious onlookers. While many fashion designers remain secretive about the creative process in fear of plagiarism, Alexsis displays it for the whole world to see. The inspiration, research and teamwork are laid bare as we examine a plethora of vague sketches, experimentations with material and different cuts, providing us with a clear vision of how one design began and how it slowly came to completion. Indeed, such a bold move is risky as it exposes you to scrutiny from public. Regardless, it’s a commended effort on Alexsis’ part, as her confidence and skill as an emerging fashion designer echoes throughout each sketch and design featured in the exhibition. Conception to Creation was featured as part of the VAMFF Cultural Program. For more information, check out Alexsis’ site here. Photo Credit: Alexsis C Star and Marchande Pty Ltd.